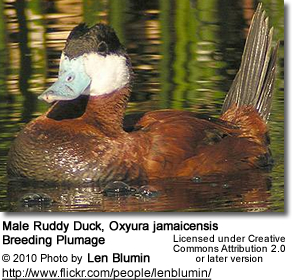 Adult males have a rust-red body, a blue bill and a white face with a black cap. 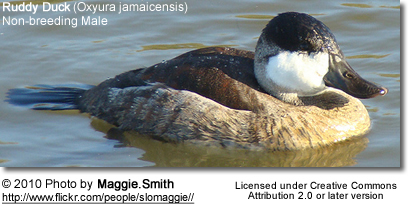 Adult females have a grey-brown body with a greyish face with a darker bill, cap and a cheek stripe. 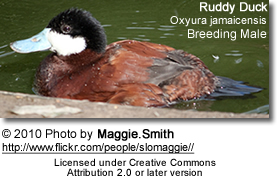 The southern subspecies ferruginea is occasionally considered a distinct species. It is separable by its all-black face and larger size. 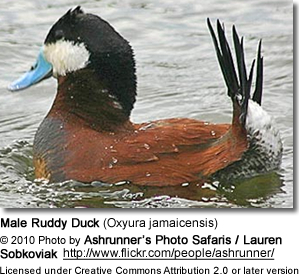 The subspecies andina has a varying amount of black coloration on its white face; it may in fact be nothing more than a hybrid population between the North American and the Andean Ruddy Duck. As the Colombian population is becoming scarce, it is necessary to clarify its taxonomic status, because it would be relevant for conservation purposes. 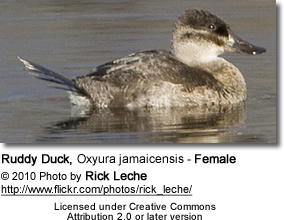 They are migratory and winter in coastal bays and unfrozen lakes and ponds. 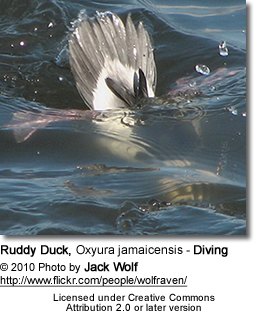 These birds dive and swim underwater. 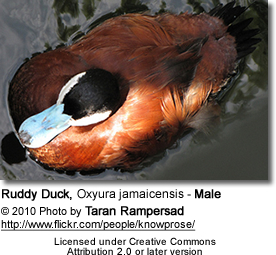 As a result of escapes from wildfowl collections, they are now established in Great Britain, from where they have spread widely into Europe. 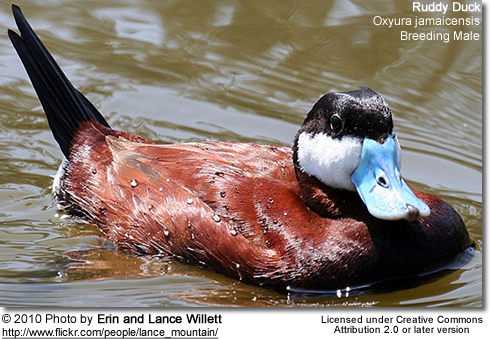 This duck's aggressive courting behaviour and willingness to interbreed with the endangered native White-headed Duck, Oxyura leucocephala, of southern Europe has caused some concern. 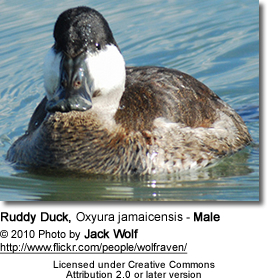 They mainly eat seeds and roots of aquatic plants, aquatic insects and crustaceans. 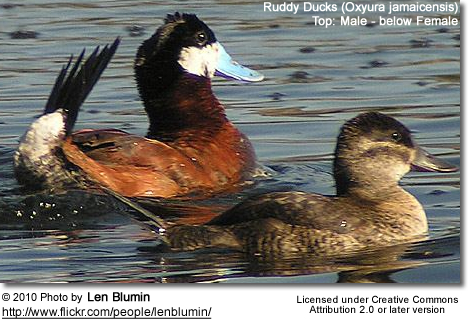 Ruddy ducks eat mainly seeds and roots of aquatic plants, aquatic insects and crustaceans.